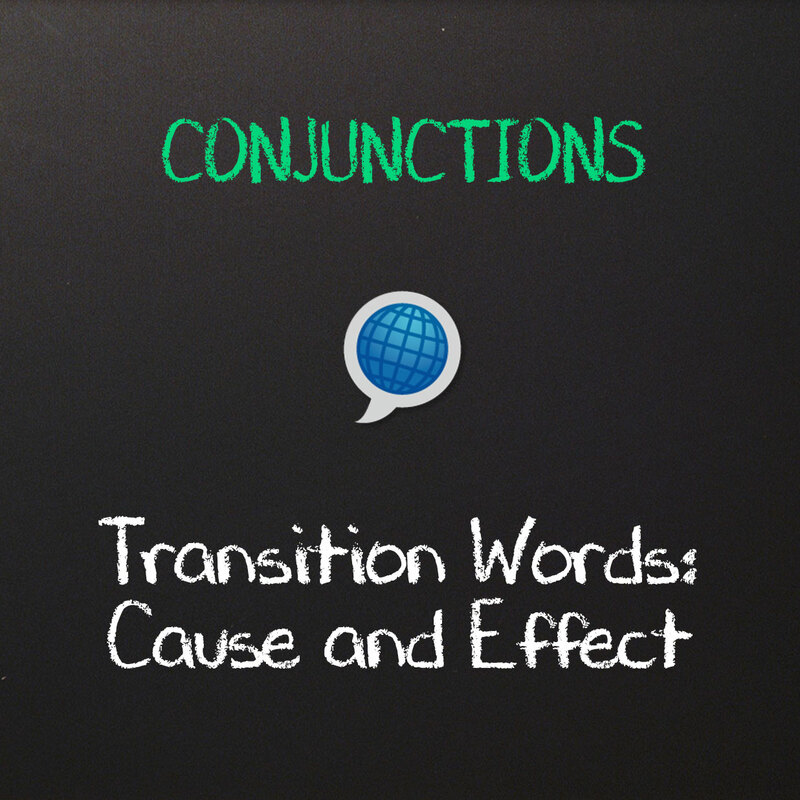 Learn how to use transition words in English to show cause and effect. In this free English lesson you will learn how to use because, since, as, because of and due to to show a cause or reason. You will also learn how to use so, therefore, thus, hence and as a result of to show an effect or result. If you like this free English grammar lesson, then make sure to download it below in pdf format and sign up for our free newsletter. Oh, and don’t forget to turn your Language On English Schools! Because and since are used to show a cause or reason. We went to the beach because it was sunny. We stayed home **since it was raining. We sometimes use as to show a cause or reason. As is used in formal writing more often than in speech. We went to the beach as it was sunny. As it was raining, I stayed home and watched a movie. Due to and because of are followed by a noun clause or ‘the fact that’. We were late due to the traffic. We were late due to the fact that there was a lot of traffic. We were late because of the traffic. We were late because of the fact that there was a lot of traffic. If the transition word comes at the beginning of the sentence, we use a comma; otherwise, we do not. Because it was sunny, we went to the beach. → We went to the beach because it was sunny. Since it was raining, we stayed home. → We stayed home since it was raining. As I was late, I didn’t eat breakfast. → I didn’t eat breakfast as I was late. Due to the traffic, we were late. → We were late due to the traffic. Because of the traffic, we were late. → We were late because of the traffic. So and therefore are used to show an effect or result. It was raining, so we stayed home. I woke up late; therefore, I didn’t eat breakfast. I have a headache. Therefore, I will stay home tonight. We sometimes use thus & hence to show an effect or reason. Thus and hence are used in formal writing more often than in speech. It was sunny; hence, we went to the beach. There was a lot of traffic; thus, we were late. As a result of is a transitional phrase and can be followed by a noun phrase or an independent clause. Transition Words and Phrases Combine the two sentences using an appropriate transition word or phrase. Do not repeat transition words or phrases! Each one may only be used once! 1. We stayed inside. There was a tropical storm. 2. Tracy failed the exam. She didn’t study. 3. Dave had a car accident. He was sending a text. 4. Mike is a good volleyball player. He wins many games. 5. My flight was delayed. I didn’t make it home in time for the wedding.